Full disclosure: I haven’t done a mural in over 10 years. 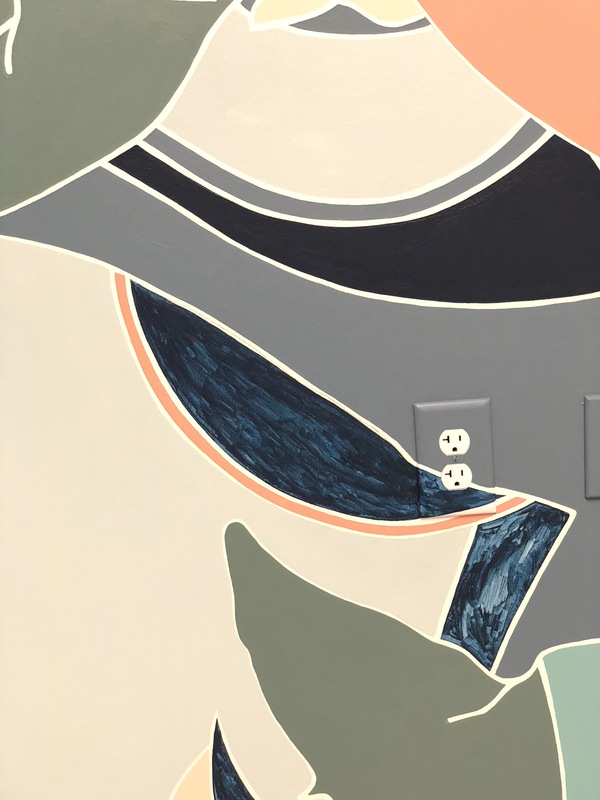 The last one I did was in Astoria, Queens with Tyler and it was a real simple concept influenced by Lee Bontecou (Tyler’s idea.) It was graphic, minimal and clean—nothing too complicated. Unfortunately, the bar closed down soon after so it didn’t get much shine. This new mural was much more of a production. 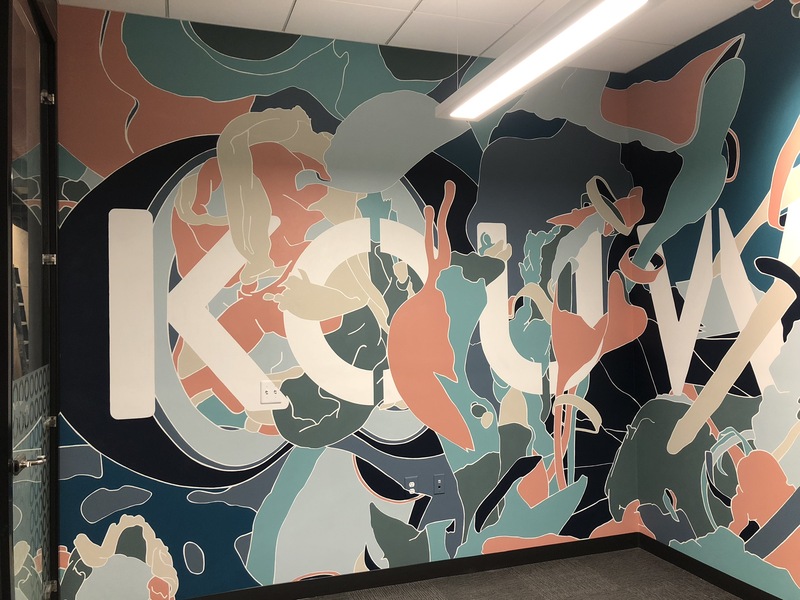 It had “only” 10 colors and stretched across 2 walls of the conference room. Some basics even eluded me at the time. I wasn’t sure which paint to use, what brushes I needed, or how to properly prepare the space. 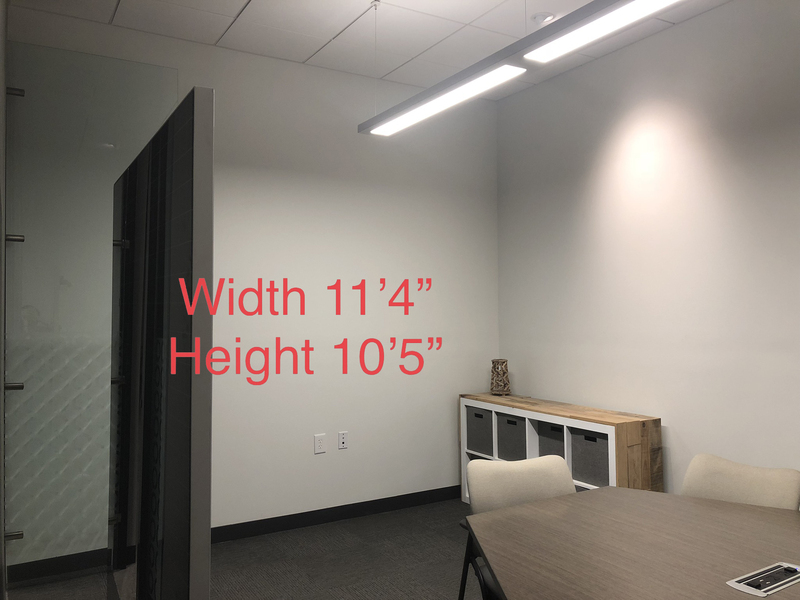 Dimensions of wall on the right. Dimensions of wall on the left. The biggest problem was: how could I transfer this image to the wall accurately and efficiently without just printing it and slapping it on like wallpaper (Yes, we even considered this!)? If only I could see how other artists do it, maybe talk to professional muralists one-on-one about tips or just watch the process right before my eyes. Luckily for me, I had all of that in the form of Pow Wow Hawaii. 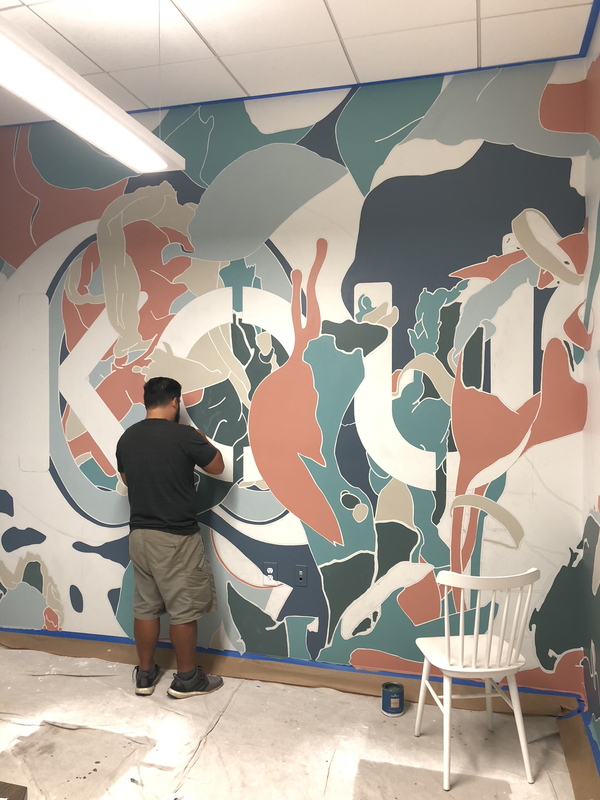 Artists locally and internationally are invited to bless the walls of Kaka’ako with new murals each year. Granted, almost all of them used spray cans, but there was still plenty for me to absorb. And for everything else, google, am I right? Besides, being around all these professionals also amped me up to get started on my walls! 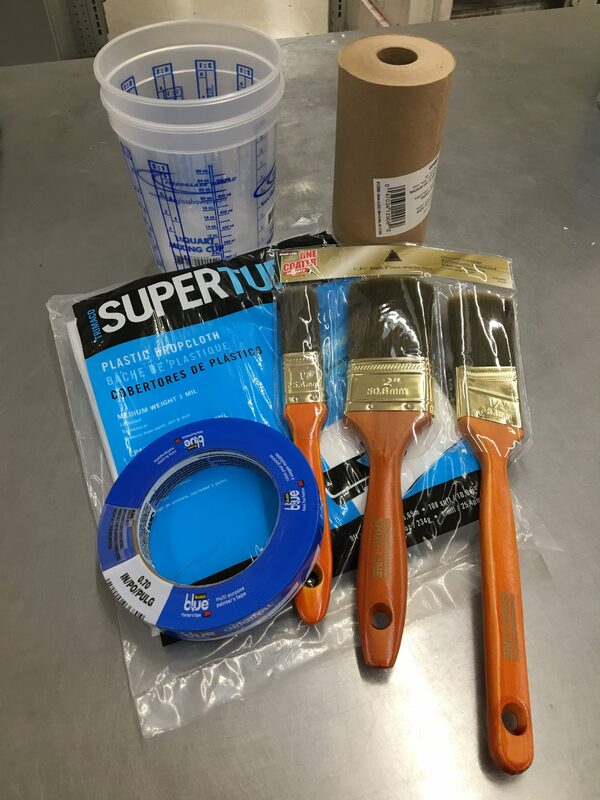 Some art supplies from City Mill. I read up on the best ways to secure the edges with blue tape and craft paper. *Note: remember to run a spatula along the edge of the tape to seal it and prevent paint from leaking underneath. I borrowed drop cloth and a ladder from the guys at Redmont. Luke and Lauren brought me to City Mill so that we could pick up the right paint. 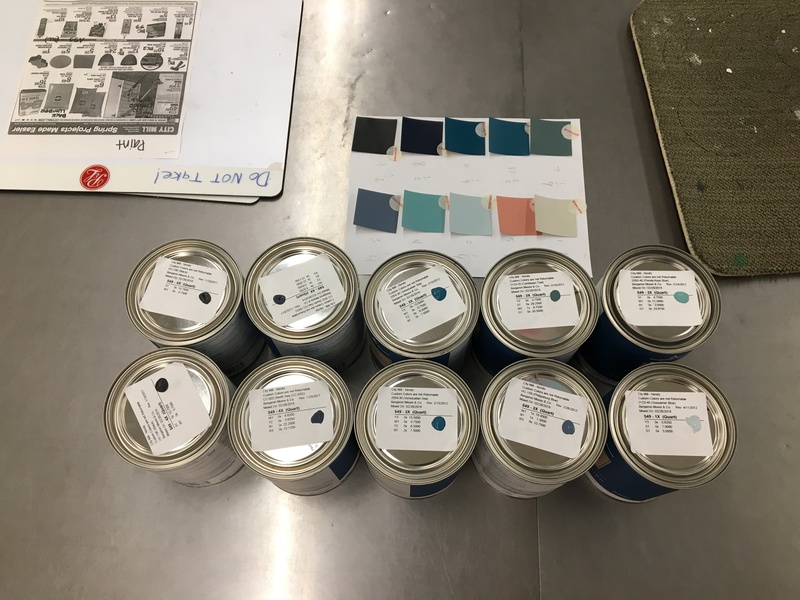 Lining up the final color palette using Benjamin Moore’s Regal Select eggshell indoor house paint. The first order of business was to get the sketch up onto the walls. Freehand was out of the question and gridding would have taken forever. The art itself was forgiving due to it’s organic characteristics, but the logo left very little room for error. 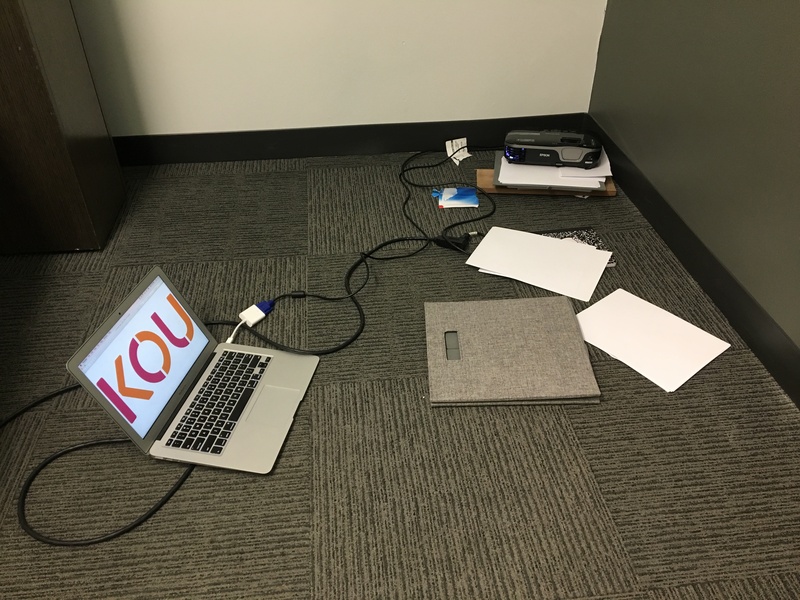 Luke’s setup for projecting the the left wall with “Kou.” Wood and sheets of paper were used to fine tune the angle when the built-in keystone software was not enough. Since the dimensions of the room were not large enough to use the projector that we had, the whole process needed to be executed in piecemeal. 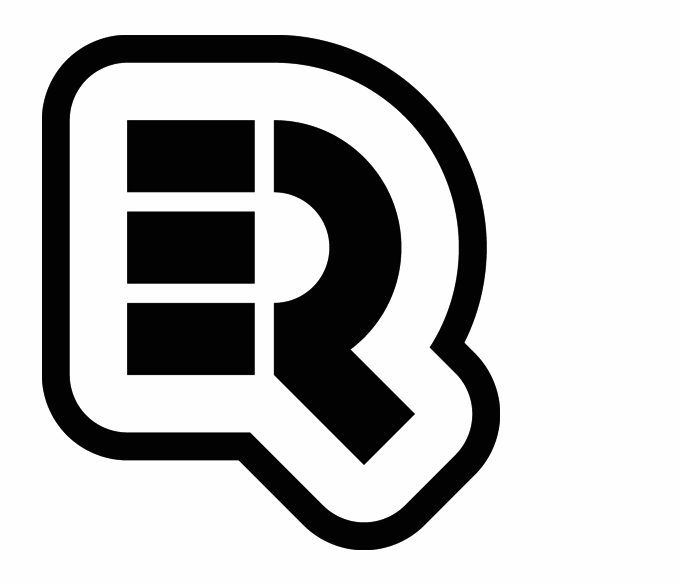 Bounding boxes for the type were measured out so that the projected image could perfectly fit into sections. Luke handled it the first day and then I eventually learned to do it by myself. Later, Jasper informed us that there are some new, albeit expensive projectors with a short “throw” for situations like this. 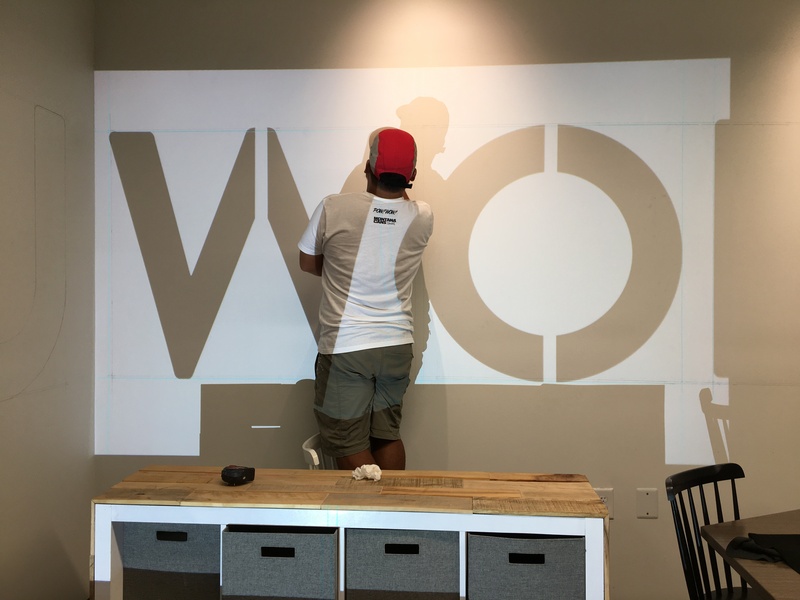 Projecting a portion of the KouWork logo. Just to be safe, I drew both sides of each stroke. This saved me in the end because I decided to leave all the lines white anyway. We thought it would be amazing to time lapse the whole project with a DSLR, while simultaneously live casting it on Facebook. Unfortunately, the batteries didn’t last long enough to produce anything good. #UserError. And the Facebook live was just not that exciting considering how slow the process was. Additionally, there were plenty of mental obstacles to deal with along the way. Every color I chose felt “too dark” and pictures did not reproduce well. From the very first color, I started to doubt myself. 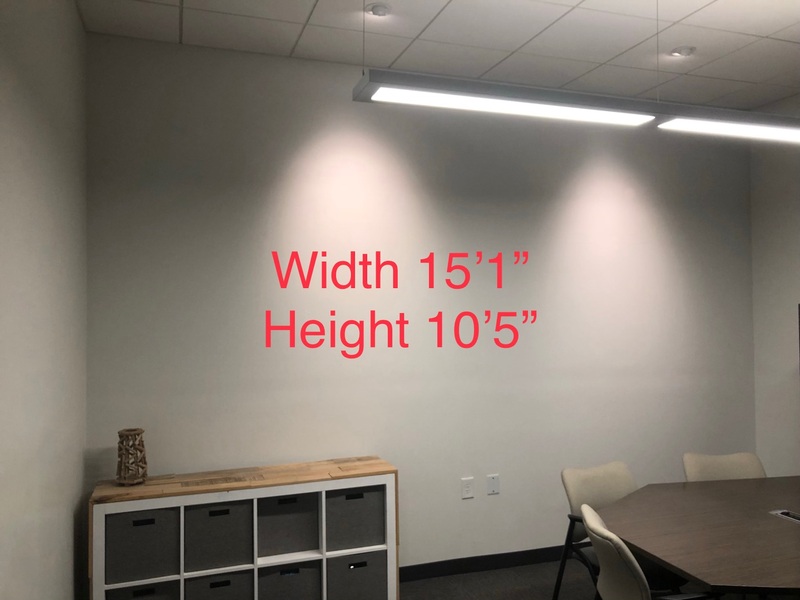 There seemed to be about a 30% increase in value, which was probably due to the current lighting situation in the office. The colors perfectly matched the swatches in the Benjamin Moore booklet, but ambient lighting definitely affected the colors a bit. Why had I not considered that!? Should I abort mission and revisit the palette? Buy a huge bucket of white and lighten the tones towards a pastel color scheme to brighten the room? “Dusty Mauve” looking brown in photographs. I mulled it over and concluded that this was most probably a result of the overwhelming white dominating the wall. As much as you tried to tell your brain to disregard it, it needed adjacent colors to quiet the contrasts. Besides, the iPhone camera could not properly balance the white in the frame so everything was just looking brown. I was convinced it was all an illusion. After some of the most restless sleep in weeks (I had nightmares about color swatches within an hour of passing out! ), I decided to forge ahead with my original plan continuing with the lightest colors. In this way, the image could emerge from the wall as values increased. I’d also have the ability to lighten darker tones if they began to react unexpectedly with the rest of the palette. This continued on for the next 4 colors or so, until I reached the dark navy. When I put it on the wall, something in me just sank and I felt like I had royally f*d up. Up until then, every color just perfectly complemented each other. In fact, it was a bit difficult to decide which was our favorite color/color combination because it was working out so well. But this particular navy blue didn’t match the family of values already painted. Maybe it was because I skipped 2 darker values in the sequence. Or maybe I just needed to see it scattered throughout the mural, not isolated to one side. “North Sea” needed multiple layers to really create that dark depth. 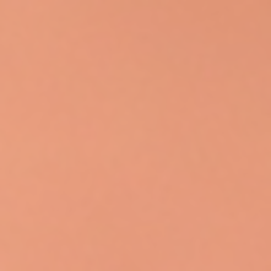 You can see four different instances of it’s opacity in this detail. With 4-5 layers, it created a nice velvety look. Again, I pushed forward and trusted in my preparations and prior calculations. Thankfully! As I added the last few colors, it just started to create that depth I was looking for. I was really afraid that this color, “North Sea”, didn’t fit with the rest of the palette..until I added enough layers to make it opaque. Although the colors in combination worked as planned, I was still worried about the lines and logo getting lost if black was painted at the end. The shade of black was too similar to the navy blue and the overall average values on the wall would have been too heavy and ominous. Also, the ambient dim lighting pushed the shades into a darker key than I desired. This was the only premonition that stuck with me throughout the process and consequently, I resolved to trust it. Rather than risking ruining the mural by adding the black, I decided to leave the white areas alone. Fortunately, there was some extra white paint left over for me to address a few touchups, smudges, drips and overpainting. 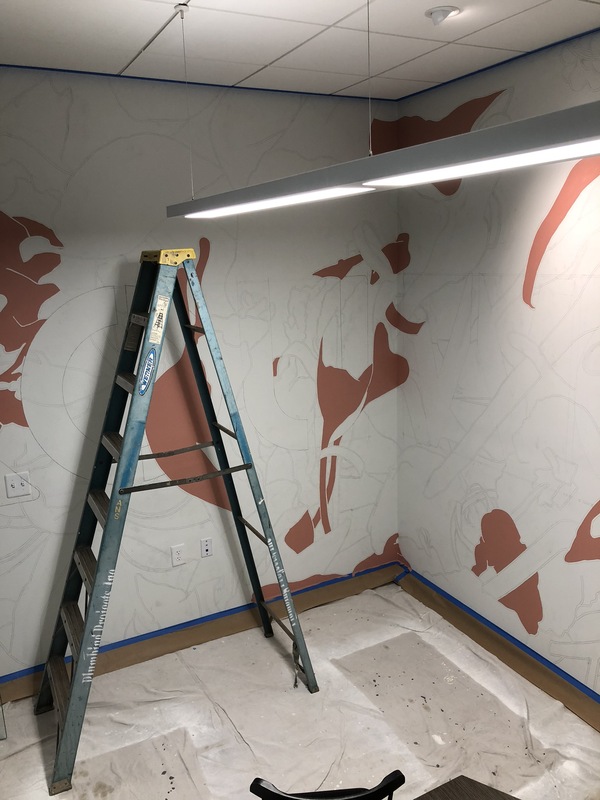 The last alteration involved changing the logo to my own personal one, instead of “No Wrong Turns.” As fitting as the brand was in this journey, I didn’t want the mural to be confused for a joint effort with Carmela. -Try to trust in your groundwork. Those decisions were not whimsical or ill advised. That being said, if the feelings continue to nag you, then by all means, go with your gut feeling. -Delegate! See if you can get help from friends on more trivial tasks like filling shapes. With more hands on deck, I could have easily cut the time in half at least. This was also a detail I seemed to neglect when observing PW artists execution times—nearly all of them had help in some way. -Price it by square footage, not by hourly. An hourly rate can be a bit deceiving. Not only may you get the estimates wrong, as I grossly did in this case, but you also won’t penalize yourself for “working too quickly.” It’s a great way to prevent scope creep on both parties. -Tier your price points based on complexity and painting conditions. Make sure to increase the rate if weather or wall surface will affect the workflow. You can always tailor the image complexity to the sketches as well. -Learn to make the tools work for you. As my photoshop teacher at Parsons always said, “If it’s taking too long, you’re doing it wrong.” Filbert brushes were amazing for fills. Stiff, indoor house paint brushes with a slanted tip were great for applying much thicker layers of paint compared to art brushes, which fell apart too quickly. Special thanks to Jeff for all his advice along the way. -Use premium eggshell indoor house paint instead of artists acrylics to save money. In this case, they came out to about $16/quart with the premium bases, which dry quicker. They also have different “base” levels to choose from before adding the dyes. I’m not sure if this is strictly proprietary to Benjamin Moore, but I’d be surprised if it was drastically different across other brands. If you can, try to stick to bases 1 through 3. Bases 4 and 5 have so much dye in it that it actually applies much thinner. It seems counterintuitive because you would think that darker colors are more opaque, but they’re not—especially when the wall starts off as white. -Try to use small sections of dark eggshell paint sparingly in your design. They are very deep when applied to the wall and can have a nice velvety look to it if it is applied evenly, but it can definitely overwhelm the mood of the room if overdone. -If you can, be mindful of the stroke direction and complexity you have in different parts of the composition. This is not a deal breaker but definitely something I noticed after a while. 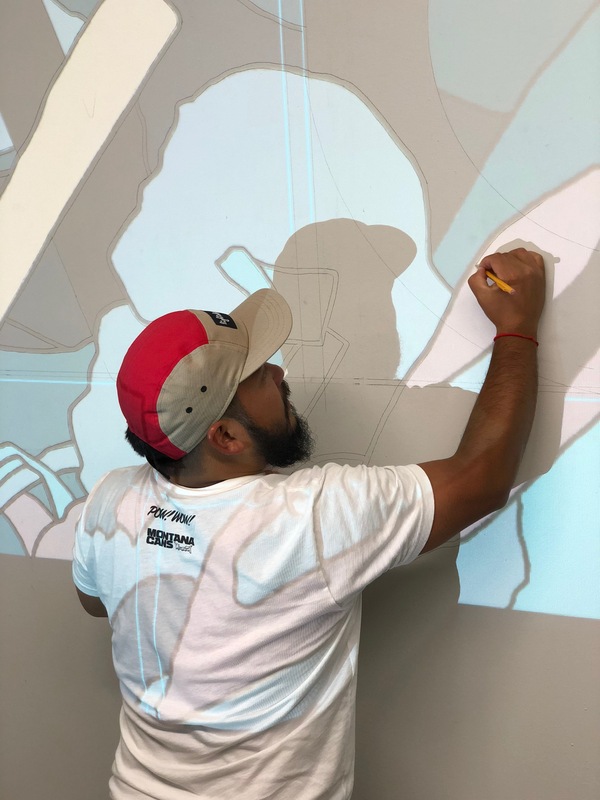 Since I had plenty of detail throughout the whole mural, I was forced into side planks and other awkward positions for extended periods of time. Overdoing detail by the edges isn’t as easy to render as isolated linework in the center of the wall at normal standing height. It just may take longer than you expected. -“Spending a little extra time in the beginning can save a lot of time in the end.” Lauren said this to Eames after he asked why I was taking so long to tape the edges. It seems like a no-brainer but this is such a great point in general. 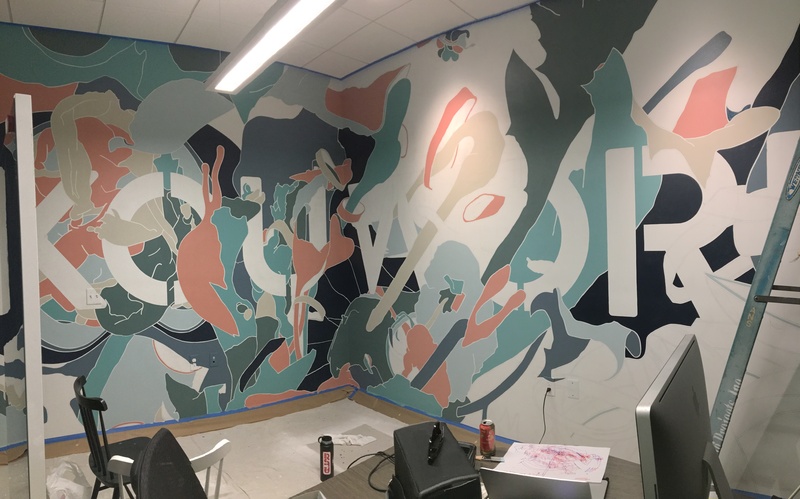 All that hard work researching and preparing the wall really paid off—many were surprised to find out it was my first mural considering my meticulousness. -Have your concept explanation down pat. I felt like such a hack when people asked about the meaning and I fumbled with my words. -Try and have some stickers/promotional cards printed for distribution so that people have a way of following your work. -Don’t be afraid to talk to professionals and mentors! Don’t try and be a hero and figure it all out by yourself if others can help you save time by sharing their experiences. Stay tuned for final mural panorama and photos from the mural unveiling party. *A special thank you goes out to Lauren, who did an awesome job snapping photos. Without her, there would be a lot of missing pieces in the work in progress storyline.